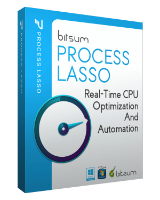 Process Lasso Pro 9 был доступен бесплатно 2 июня 2017 г.
Кроме того, пользователь может автоматизировать все виды системных настроек с помощью правил и постоянных приоритетов процессов, аффинности процессора и т.д. Однако данные настройки не терпят ошибок и предназначены в основном для продвинутых пользователей. Программа может также прекрасно работать "прямо из коробки" без дополнительных настроек со стороны пользователя и выполнять свои основные функции. Новый фильтр процессов - показывает лишь интересующие вас процессы. Возможность приостановки/возобновления графика и списка процессов. Улучшенный модуль Insights, который обеспечивает новую частоту действий и многое другое! Улучшенный код, бесчисленные изменения и улучшения. 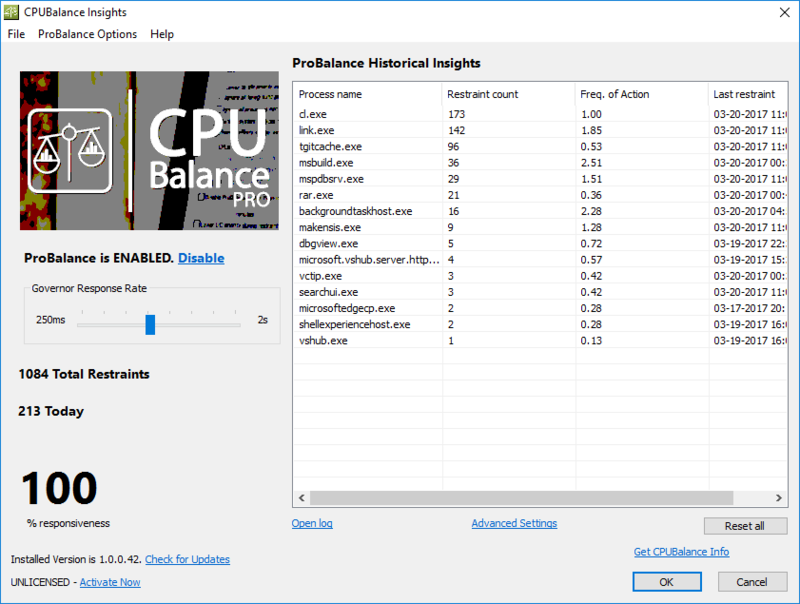 Новый регулятор скорости ответа для более легкой настройки ProBalance! Все сделал как положено, а на почту ничего не пришло ???. В чем проблема??? на почту .ru и не придёт. Заводи нормальную почту .com! Kescha, на почту .ru и не придёт. Заводи нормальную почту .com! terryfan, спасибо за совет. установка и обновление- только в течении месяца, а программа за этот период порой трижды обновляется. Как пишут на их сайте: ключ для этой версии не нужен, ключ нужен только для платных версий. Скачал программу, установил, прошел регистрацию на сайте. А ключ не получил. Написал им в саппорт. Жду ответа и ключ на программу. Скачал программу, установил, прошел регистрацию на сайте. А ключ не получил. Написал им в саппорт. Жду ответа и ключ на программу. а где на ХР ? I have had Process lasso from a GAOTD offer approx 2 years ago. Those who are running W7-64, see no difference and are quick to uninstall it, sadly, are missing the boat. It has been my experience that Process Lasso keeps the "log jams" to a minimum. 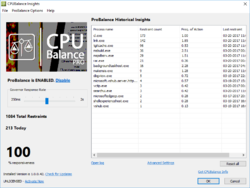 Some software tends to occasionally "hijack" the lions share of processor time. Result: you sit and wait till your system is ready to move forward. Over time, you will notice fewer of these log jams and a smoother computer. Will it prevent all log jams ? No. This is the reason you see such high thumbs up ratings. Patient people have installed it and just sat back. For the most part, most users can install it and let it run on it's own. It's default is fully automatic operation. It sits in the background acting as processor traffic cop. I have also observed it is very light with it's own process cpu time. If you are installing it and expect to immediately see your computer run like the wind, you have missed the point. If you are the fastest runner in the race and you keep tripping on potholes, you lose the race. With this pgm, don't look for faster, look for smother. What was not mentioned in the product description above was the kind and particularly generous offer to INCLUDE updates for FREE !!!!!! I do not know if this offer (which may have been a limited offer) is still in effect. Overall, it's a definite keeper. I have had Process lasso from a GAOTD offer approx 2 years ago. Those who are running W7-64, see no difference and are quick to uninstall it, sadly, are missing the boat. It has been my experience that Process Lasso keeps the "log jams" to a minimum. 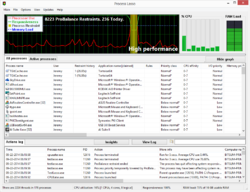 Some software tends to occasionally "hijack" the lions share of processor time. Result: you sit and wait till your system is ready to move forward. Over time, you will notice fewer of these log jams and a smoother computer. (SIDE BAR: Will it prevent all log jams ? No. However, it appears to make a major difference in the long run) This is the reason you see such high thumbs up ratings. Patient people have installed it and just sat back. For the most part, most users can install it and let it run on it's own. It's default is fully automatic operation. It sits in the background acting as processor traffic cop. I have also observed it is very light with it's own process cpu time. If you are installing it and expect to immediately see your computer run like the wind, you have missed the point. If you are the fastest runner in the race and you keep tripping on potholes, you lose the race. With this pgm, don't look for faster, look for smother. What was not mentioned in the product description above was the kind and particularly generous offer to INCLUDE updates for FREE !!!!!! Holy cow ! I do not know if this offer (which may have been a limited offer) is still in effect. Overall, it's a definite keeper. That's my 2 cents. 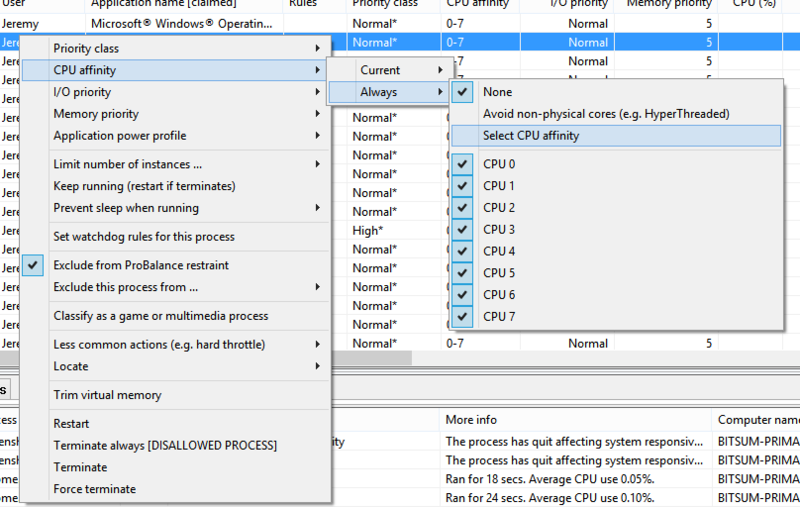 It is not as simple as it looks, in order to speed up some processes you have to take the CPU time slices from somewhere else, because the CPU operate at fixed frequency and the calls to the registers like audio, video, communication drivers and so on must be addressed and CPU must wait for them to finish sending the next instruction code. If you slow the processes in the background (there is where the drivers operate) you will slow the display and communications and even might get choppy audio, just to speed up a foreground operation like word processor. 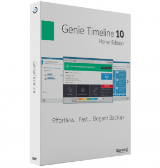 This software worked better on old OS's from win 98, XP and even win 7, but with multi core processor and win 10, there is no measurable difference, in reality it may make the things worst. 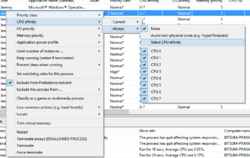 It is not as simple as it looks, in order to speed up some processes you have to take the CPU time slices from somewhere else, because the CPU operate at fixed frequency and the calls to the registers like audio, video, communication drivers and so on must be addressed and CPU must wait for them to finish sending the next instruction code. If you slow the processes in the background (there is where the drivers operate) you will slow the display and communications and even might get choppy audio, just to speed up a foreground operation like word processor. This software worked better on old OS's from win 98, XP and even win 7, but with multi core processor and win 10, there is no measurable difference, in reality it may make the things worst. This is a tool not a lucky charm. Would you buy a full set of automotive tools and test equipment, put the stuff in your garage, and then expect your car to start running better? I suggest that you investigate all of the Options and understand what they do. 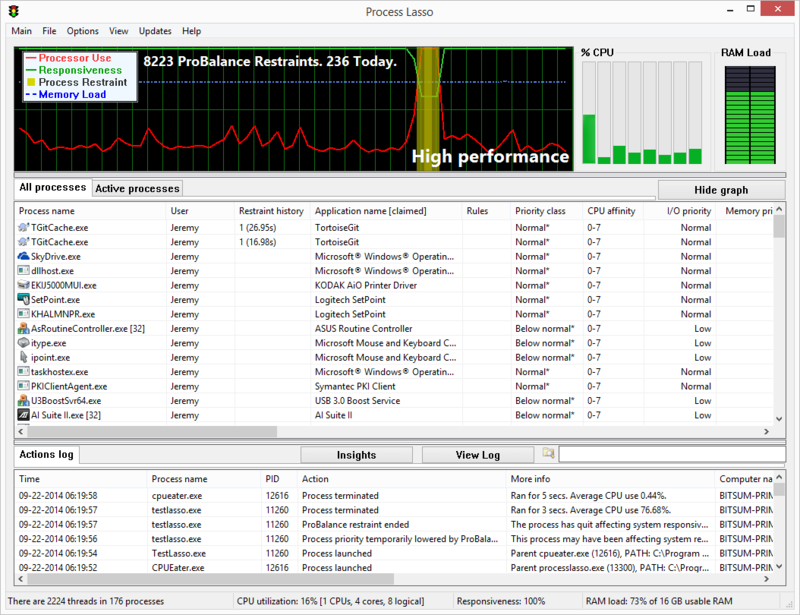 Process Lasso is always one of the 1st packages I install on a new computer. I have a new Dell Vaio laptop and I use Process Lasso Pro all the time to tweak the response of what ever I am currently working on. Sometimes I want a process to work quietly in the background and other times I may want that same process to hurry up and finish because it is a bottleneck for what I am want to work on next. Its like having a speed control on your car and not changing the setting when you leave the freeway and drive on a twisty mountain road ... there will be problems. Learn and use this tool and I believe you will appreciate it as I do. This is a tool not a lucky charm. Would you buy a full set of automotive tools and test equipment, put the stuff in your garage, and then expect your car to start running better? I suggest that you investigate all of the Options and understand what they do. Process Lasso is always one of the 1st packages I install on a new computer. I have a new Dell Vaio laptop and I use Process Lasso Pro all the time to tweak the response of what ever I am currently working on. Sometimes I want a process to work quietly in the background and other times I may want that same process to hurry up and finish because it is a bottleneck for what I am want to work on next. Its like having a speed control on your car and not changing the setting when you leave the freeway and drive on a twisty mountain road ... there will be problems. Learn and use this tool and I believe you will appreciate it as I do. Does Bitsum still offer a Non-BUSiNESS Home Server version any longer? I thought I found a separate Home Server webpage back before you changed the appearance of the website but can't find it mentioned on the WorkStations or Server pages today. Does the entire "Entire Home Lifetime $67" Purchase Option (less any current discount coupons, such as Todays 50 % Off) allow for 1x (private use) Home Server in the number of computers covered by the License? So instead of 5 HOME USE computers, the Entire Home = 4 Home Use Workstations + 1 NON-BUSiNESS Home Server.